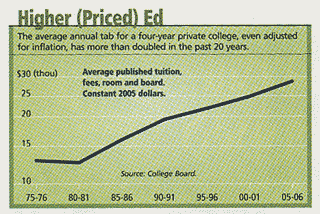 Forbes used this chart to illustrate the doubling of tuition at four-year private colleges in the last two decades. The designer made two curious design choices: sampling at 5-year intervals, and log scale. To investigate these choices, I first reversed them, producing the chart on the left below. This chart shows the upward doubling trend very clearly so neither design choice added information. Sampling at five-year intervals reduced the sample size from over 20 to 6. It creates an illusion of smooth linear increases over time when in fact there have been some declines in real terms from year to year. The introduction of a log scale is inexcusable. With no extreme values, the raw data fits nicely onto the graph. When the purpose of the chart is to show changes between periods, the log scale creates unwarranted distortion as a given difference at higher tuition values now represent more difference than the same physical distance at lower tuition values. 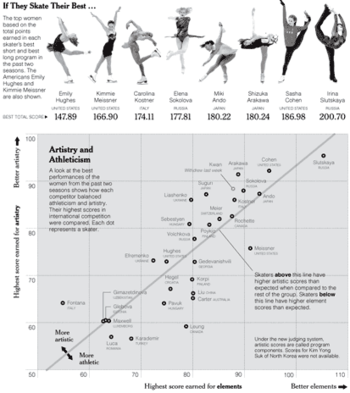 One can scarcely find a media outlet more committed to printing interesting data graphics than the New York Times. By printing the following scatter plot, it shows a level of sophistication as yet unmatched. Reference: "Cohen Cultivates Sublime Status: Quiet Contender", New York Times, Feb 21 2006. This graph cited by Mahalanobis deserves closer scrutiny. Several commentators have concluded that happiness is not explained by income because the gap between Republicans and Democrats is 10% or so at each income level. Much information is obscured by this simplistic conclusion, and by using a grouped column chart. In fact, the inherent symmetry in this observation has been sidestepped. The gap between the rich and the poor is also constant for each party affiliation. 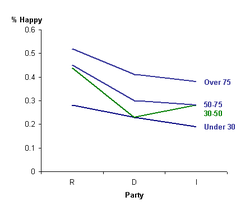 In other words, rich Americans are happier by the same degree whether they are Republicans or Democrats. What's more, the gap in happiness between the rich and the poor is about 20%, twice that between the parties. This observation is more clearly depicted in the line chart shown on the right. The gap between the top and bottom lines is about 20% throughout the chart. By contrast, the difference between R and D is about 10% (focus on first segments of the blue lines). Thus, the story is more about income groups than about parties. Actually, the most interesting feature in this data concerns the $30K-50K income group (the green line). The green line is the only one that is not roughly parallel to the other lines. Republicans and Independents in this income range behave like the next richer group while Democrats behave like the next poorer group. Could it be that the cutoff point for defining this income group hasn't been selected correctly? Indeed, how is this choice made? Technical note: equal gap for each income level indicates no income-party interaction effect, which leads to the symmetry interpretation. No interaction effect does not preclude strong income effect and strong party effect. We show that the income effect is about double that of party. The sports pages also print some breathtakingly good charts, like this one on the left. The chart traced the course of an Olympic race called the "snowboardcross" (one word ?!) It compresses many dimensions onto the printed page, including the relief of the course, the changing positions of the racers at each turn, the time dimension and the identities of the racers. The design is clean and efficient so that the data do not overwhelm us. I suspect that readability can be enhanced by toning down the shading and shaping of the relief features but as it stands, it is still a marvellous chart. Reference: "Westcott Outlasts the Cranks and the Crashes to Win the Gold", New York Times, Feb 17 2006. Visual metaphors often lead chart designers astray; in a bid to create "contextual" charts, they often give up content in search of form, often inadvertently. In this example (shown right), the NYT wanted to use the ruler metaphor to measure snowfall. This is a very difficult chart to read as it tries to tell two stories at once: first, the accumulation of snow during the 2006 blizzard; second, the extent of the snowfall relative to 12 historical blizzards. The "ruler" metaphor requires a tall and thin chart. Unfortunately, this completely distorts our perception of the passage of the storm. 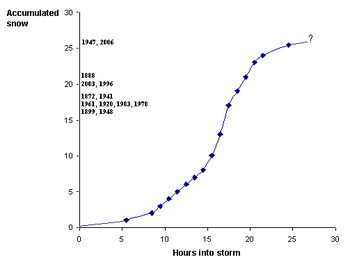 In the junkart version shown below, we see that the speed of snow maxed out around 15 hours into the storm. I have placed the historical levels on the side so as not to interfere with the rest of the graph. I also switched to the relative time axis which tells the story much better. There is one curious omission on the graph, that is, at what time did the snowfall total top out at 26.9 inches? This is an inexcusable omission for this chart. Overall, our chart is much cleaner and easier to understand. Reference: "Exceeding Forecasts, 26.9 Inches of Snow Hit New York City", New York Times, Feb 13, 2006. Memo to new owner: what's the point? Software company Siebel's new owner Oracle put out an embarrassing ad this week; I excerpted the bottom half here. The headline of the ad (see the full ad here) screams in large, bold, white letters: "BUSINESS IMPACT COUNTS." How were these ratings obtained? Which experts determined the scores? What is the scale? How much better is a quarter of a circle? What does it mean by "business impact"? What exactly is being measured? Why are the circles of differing radii? What do radii signify? Isn't "Adoption" the category that has the largest separation between the two companies? Why isn't that highlighted?
" We see that Toronto's probability of winning rose from the start as they prevented the Phillies from scoring in the first inning. This trend continued as the [Toronto] Blue Jays scored three times in the first inning... The low point in the [fifth] inning for Toronto occurred just after [Phillie] John Kruk walked to load the bases. [Phillie Dave] Hollin's big out is shown by the rise ... in Toronto's victory probability from this low point ... in the seventh the Phillies turned the tables ... scoring five runs to take the lead. The plot of Toronto's probability of winning looks like the Dow Jones Industrial Average in free-fall. Toronto did not score in its half of the seventh, pushing its probability of winning even further down. ... the plot rises (and the plot thickens) in the eighth inning as a result of a threat with bases loaded and two outs. In the ninth inning, the Phillies went down quickly. Toronto came out storming, ... quickly putting runners on base. 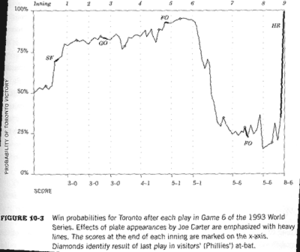 The triumphant ... impact of [Toronto's Joe] Carter's home run is evident in the steep rise in the final markings of the plot." This chart belongs to the same class as the Bumps chart. In a previous post, I traced how one can re-imagine the Bumps race just by tracing the plot from left to right. Reference: "Curve Ball", Albert & Bennett. Chartjunk is not the only species of junk out there; another is "statjunk". The sports media is filled to the brim with statjunk. In the graphic on the left, focus on the bar chart at the lower left corner. According to the author, "stability brings success". He's saying the more coaches a team has employed since 1992, the worse has been its record. The word "bring" implies causation. But nothing in the data warrants this conclusion. Which explanation is more plausible? The Steelers has kept Coach Cowher since 1992 because his teams had accumulated a good winning record during this period. It amazes me that given this choice, the sportswriter inevitably will pick the first explanation and assert its inviolability. Has anyone given this fallacy a name yet? 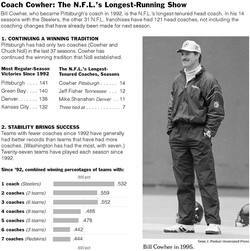 Reference: "Stable and Steady Has Won the Race for Steeler", New York Times, Feb 5 2006. Narrative charts, like this one shown on the right, are particularly difficult to master. The temptation is strong on the part of the designer to mislead by inclusion/exclusion and on the part of the reader to misjudge by reading between the lines. 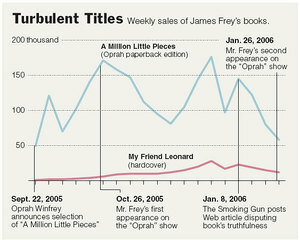 The accompanying article made the point that James Frey's fraudulent memoir experienced a severe drop in sales since Oprah "sacrificed" him. Unfortunately, what the chart shows is how choppy sales have been for this book. It experienced a similar drop after his first appearance on Oprah. How to explain the end-of-year rise in sales back to post-first-Oprah-appearance level? What is the purpose of the red line? Is it fair to compare a hardcover with a paperback? Oprah's influence appeared to be highly specific to the recommended book and time of the show. There seemed to be zero impact on the sales of other books by the same author (scale effect?) and a rapidly diminishing impact even for the highlighted book. Is this a general phenomenon? This type of time-series chart does not provide direct evidence of cause and effect; however, they are commonly used in the media for that dubious purpose. At the best, we can conclude that those factors are correlated, prompting hypotheses and further analyses. Reference: "James Frey's Falsehoods Improved His Tale", New York Times, Feb 1 2006. Continuing the book review. The reader who sent me the book noted that the authors used a similar technique to the one I used to study whether suicide spots on the Golden Gate Bridge were random (see here, here, here, here and here). 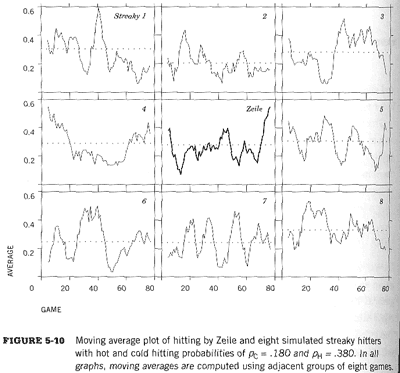 They used it to study whether Todd Zeile was really a "streaky" hitter or not. Here, we want to know whether the graphs are similar; in my graphs of suicide locations, I asked whether the actual data is different from random. In general, I find it easier to see differences than similarities. In both cases, it is not sufficient to visually inspect these charts. We must use some tests (possibly statistical tests) to help confirm our intuition. 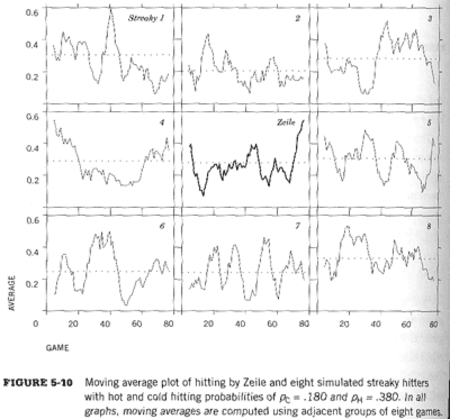 The authors picked these metrics: Max - Min, Number of long streaks (8 or longer), Number of runs, Number of 0-hit games and Number of 3+ hit games. (A "run" is a string of consecutive 0-hit games or consecutive games with at least 1 hit.) These are all measures of dispersion or extreme values. My first review can be found here.